OK, this is going to be a bit weird. Â Then again, so am I. Regular readers will know that I have played the Sims games from the start in 2000, upgrading to Sims 2 in 2005 and until I got Sims 3 this summer. Â Over time I developed a special way of playing, where I was always looking out for the happiness of my imaginary characters. 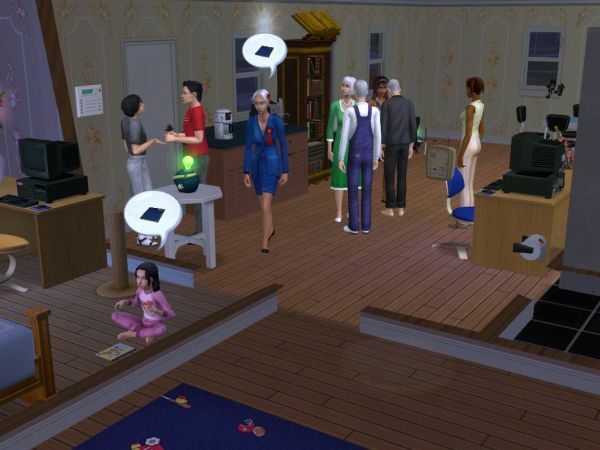 Â This culminated in the Prosperity Challenge project, where I took on the role of “Guardian Angel” for a whole neighborhood of Sims, simulated people “living” in my computer. Â For each and every member of each and every family, I would seek to provide a balance between their free will, their immediate needs and guiding them toward becoming the most they could be within their aspiration. The neighborhood started as six small families, broke and deep in debt, with no skills, no jobs and no friends outside the family, and all of them having lost loved ones before seeking refuge in the small mountain village. Â From this foundation I gradually nurtured a village filled with love and friendship, where the various talents worked together to create a better future for all. Â A good education, a harmonious family, a career fitting to fulfill their lifetime wants. Â Befriending the randomly generated, computer-controlled characters they met in school, college or work, they drew more and more people into their society, starting to take the shape of a small town. And I would still take care of each of them individually, sometimes taking into account things that had happened much earlier in their lives (and months ago in my own timeline). What was it that tempted me to take up such a hobby? Â And why did it take this particular form? Â Many players of the game will torture and even kill their characters, or use them to play out scenarios of casual or uncommon sexual relations. In a way this makes sense since they play for the enjoyment of the player, who is real, while the little computer people are not. Â Or not by our standards. Â To me, they were conferred a secondary reality, a thin and wavering one for sure, by the virtue of living inside my mind. Â They were, as I see it now, inhabitants of the second dimension. Â And it was natural for me to want to treat them the way I would want someone from a higher dimension to treat me. If we for a brief time suspend disbelief (lots and lots of disbelief) and imagine that I lived in the world described by Ryuho Okawa in his “Laws” books… suddenly this all makes more sense. Why was I drawn toward acting as an angel toward lesser beings? Â Because I actually was a higher-dimensional being myself, incarnated in this world as part of my education. Probably not an actual angel from the seventh dimension, but not all that far off: Â Quite possibly from the Realm of Light in the sixth dimension. Â Regular readers will know that I constantly make references to the Light where others might say God or Buddha or The Almighty or some such. This fairly lofty origin (though still far from the top) would explain why I was born with unusual intelligence and a deep longing for knowledge and insight in the workings of the world, or why I wanted to be a prophet at an age where other boys wanted to be fireman or pilot. It would also specifically explain my programming skills. Perhaps I was sent to Earth merely for my own education, but probably not: Â I may have had some specific task in sights when I incarnated, something that would benefit many people, as is frequently the case for those who descend from that sphere. But unfortunately, something went off track and whatever I was meant to do, never happened. Â Instead I ended up alone, watching the world as if from a distance, while helping my Sims achieve the happiness and prosperity I was sent to give the humans of this world. Where did I go wrong? What caused me to turn my back on the human world, to “bury my talent” (to use an expression from one of Jesus Christ’s stories)? How did I forget my purpose on this plane of existence? I honestly don’t have a clue. Of course, my cluelessness could simply stem from not living in a world where Atlantis and Mu were real continents and where most of the world’s gods and heroes were at some point real (albeit somewhat different from how they are remembered today). That instead we each only have one life in this world, and then a final judgment, if even that. Â Living in a world where talents are bestowed by genetic lottery rather than celestial hierarchy, a world that will eventually be deserted and share the fate of Venus, and where all our words and all our works will be utterly wiped from the visible universe like footsteps in the sand before the rising tide. This entry was posted in games, religion and tagged Happy Science, Sims 2 by itlandm. Bookmark the permalink.